Updated at 8:54 a.m. ET. 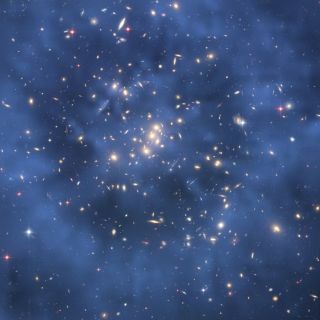 Dark matter — the mysterious stuff that is thought to make up most of the matter in the known universe — may reveal itself during the next decade, one prominent scientist predicts. When the moment comes, it will result in "a pivotal paradigm shift in physics," Gianfranco Bertone, a physicist with the University of Amsterdam in the Netherlands, said in a talk on dark matter research at a Royal Society Frontiers of Astronomy conference in London in November. The universe contains much more matter than scientists can currently detect. Models suggest that this unseen matter makes up about 85 per cent of the universe, but nobody is sure what this missing matter is made of. Telescopes can't observe it, because it gives off absolutely no light. So far, the only evidence of dark matter's existence comes from the gravitational effects it exerts on visible matter. "We see the effects on all scales with astrophysical and cosmological observations," Bertone said. But despite promising hints from numerous recent experiments, the hunt for dark matter's true identity goes on. The key candidates for the stuff so far remain restricted to the realm of theory — weakly interacting massive particles (WIMPs), believed to constitute the bulk of dark matter, and axions, assumed to be much lighter and colder particles. It is thought that there are a lot of axions around, and that they constantly rain down on Earth from space. Scientists are more hopeful than ever of success despite the failure of one of the most promising detectors, the Large Underground Xenon experiment (LUX), to spot dark matter particles during its first 90-day run in 2013. LUX is a liquid xenon experiment set up to detect the extremely rare collisions between WIMPs and regular matter on Earth. It is buried about 1 mile (1.6 kilometers) deep in a mine in the Sanford Underground Research Facility in South Dakota. In 2014, LUX will probe for dark matter longer than ever before, during an upcoming 300-day run. Besides hiding detectors underground, there are other ways to search for the mysterious dark matter. For example, there are direct detectors located in space, such as the Alpha Magnetic Spectrometer, which was installed on the International Space Station in 2011. AMS looks for the shower of radiation that dark matter particles are assumed to produce as they collide and annihilate. It is thought that this radiation also includes gamma rays. Another space-based detector is NASA's Fermi telescope, which launched in 2008. This instrument is scanning the center of the Milky Way galaxy, where dark matter is believed to be concentrated, looking for excess gamma rays. Many scientists are placing their bets on the Large Hadron Collider. Once it is up and running again in 2015, it will resume smashing particles together, in the hope of creating dark matter in the lab. The LHC aims to create a type of matter called supersymmetric dark matter. If the LHC finds any particles that could be dark matter, its results would be compared to the data from astroparticle experiments. "It is quite clear that unless the theoretical description of dark matter is very simple, it will be hard to identify it with a single type of experiment, whereas a combination of them should provide sufficient information," Bertone said. Although the current experiments are looking for specific particles that scientists believe dark matter may consist of, many researchers remain open to the possibility that dark matter could be made of something completely different. It's also possible that a whole zoo of particles makes up the invisible matter, Bertone said. "Many studies today address the possibility that dark matter is made not of one but [of] many particle species." So even if scientists do not find the particles they are currently looking for, it will not automatically mean that dark matter does not exist. "The only way to prove that dark matter does not exist is to show that all these data have been misinterpreted, for instance because the law of gravity we adopted — Albert Einstein's Theory of General Relativity — is wrong," Bertone said. "Despite much effort, no satisfactory theory of gravity exists today that can be reconciled with all observational data without assuming the existence of some forms of dark matter." Einstein’s general theory of relativity describes how objects warp space and time to create gravity. But many scientists think that dark matter will end up showing its face, and soon. "In my view, the single most promising class of dark matter experiments over the next decade are the underground detectors — LUX, XENON-1ton, LX, and others," said Dan Hooper, a physicist at Fermilab in Batavia, Ill. The detectors "just keep getting more and more sensitive, and already rule out many otherwise attractive dark matter candidates. The LHC and gamma-ray telescopes are also very important players in the hunt for dark matter," he added. And, Hooper said, the Fermi gamma-ray space telescope may have already spotted hints of WIMPs on a number of occasions, most recently in 2013. The telescope detected a weird light shining near the center of the Milky Way galaxy — possibly sparks of gamma rays from dark matter particles at the ends of their lives. Editor's Note: This article has been updated to correct statements made by Gianfranco Bertone regarding the certainty of finding dark matter.